Smart, bold approaches to complex issues. They point to the gray areas of a debate, avoiding the simple black-and-white talking points on each side of an issue. Nothing cools faster than a hot take. Not all commentary ages well, but several major works by the Globe Ideas section stand out for being just as readable and relevant today as they were when first released online to readers locally, nationally, and globally. Perhaps even more so. Ideas sets a thinking-person’s agenda, short-term and long. It has a 14-year track record of navigating currents of thought, dissecting big ideas, and analyzing an ever-shifting intellectual landscape. The work this year was no exception. In August, Ideas devoted an expanded section entirely to the topic of food. 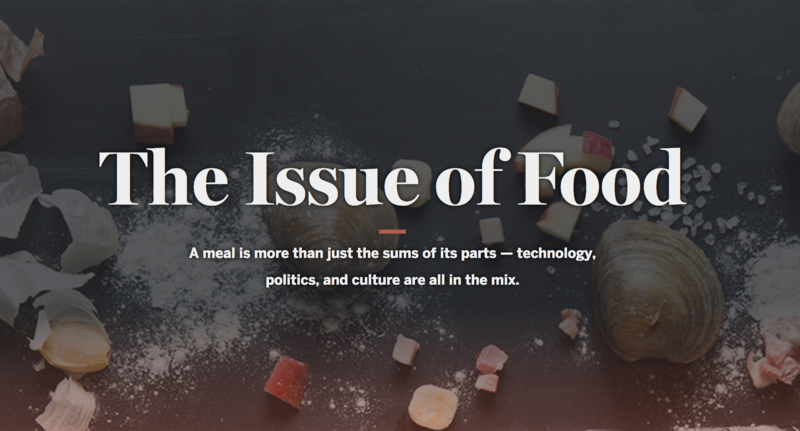 Reported articles, data-driven presentations, op-ed pieces, video packages, and user-submitted content looked at the many facets of food — from its regulation, to its cultural evolution, to the technology shaping its global future. Readers submitted touching remembrances of meals past before the section was published, then later interacted with a captivating online presentation of the section’s custom-created Web treatment. In November, with the influx of Syrian refugees ungluing the European Union, even as they perished in droves beneath the waves of the Mediterranean, the Globe Ideas section presented readers with that raw truth — not with photos, but dots. 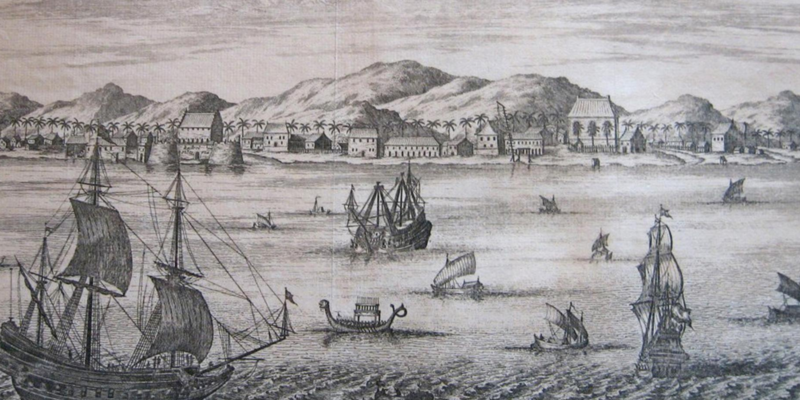 “The terrorist among us” is a product of its time, as well as its age. 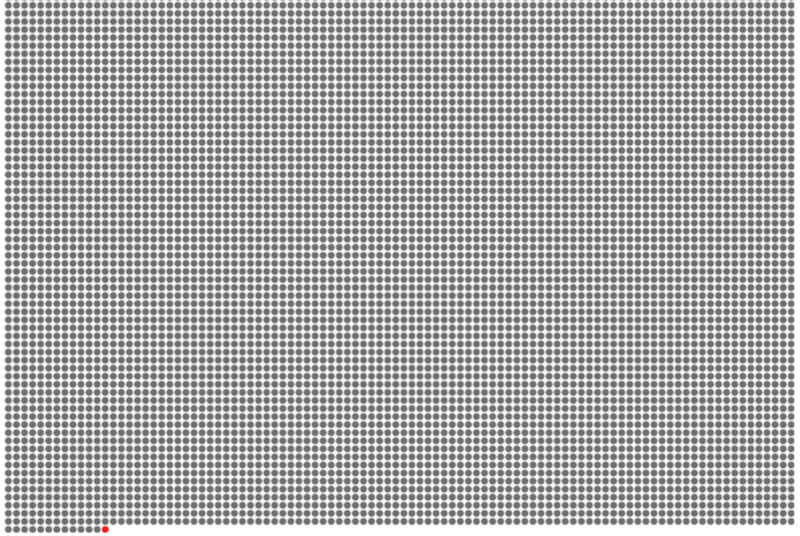 Published days after a massacre in a Paris theater, the piece challenged readers to empathize with pixels and asked how many innocents should be pushed back out to sea to make sure a terrorist didn’t get past. Reader response was as verbose as it was conflicted, which was to be expected in a city that had suffered so recently at the hands of foreign-born extremists. Presented with an online version optimized for mobile, the piece demanded of readers’ eyes the close scrutiny which it duly received. By early April, it was apparent that Donald Trump was running a campaign for the presidency so divergent from the country’s long-established political traditions, that an extraordinary editorial was in order. Editorials speak for themselves, but are often drowned out. 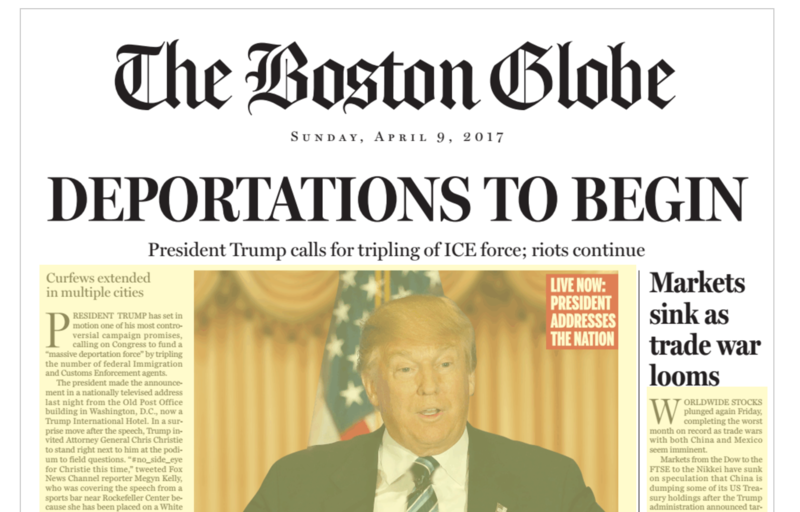 So we created the page we hope never to publish — a faux front page featuring President Trump and the banner headline “Deportations to begin.” The editorial that the faux page illustrates is just as relevant as the fictionalized stories that extrapolated from the candidate’s own words. His vision of America promises to be as appalling in real life as it is in black and white on the page. Response to the package was immediate and global. The unique online treatment made clear to readers that the page wasn’t the front page of the actual newspaper and that the stories were not a product of the newsroom. A guerrilla, cross-platform social media campaign built anticipation and buzz before its eventual release. Millions watched the video made to promote it. Discussion of the piece continued on television and radio, in print, and online for weeks after its release and is often mentioned today in meetings of the editorial board. Each of these efforts by the Ideas section are notable not just for their creative approach to reaching eyes and changing minds around the world, but also for the way they’ve aged. All commentary becomes dated, but only the best of it looks better in retrospect.